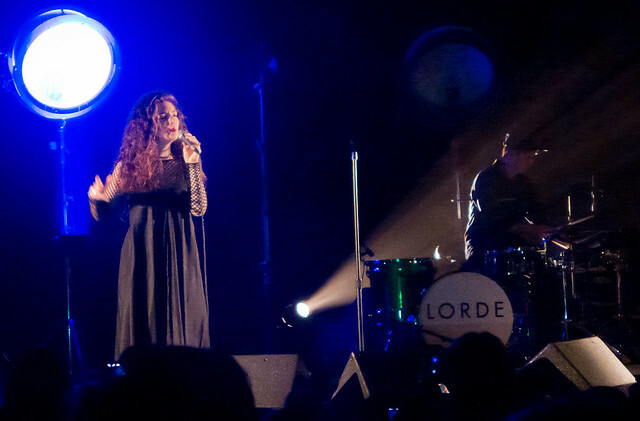 Lorde performs to a sold out crowd at The Fonda Theater in Los Angeles. Lorde continues dominate the headlines, good or bad - whether it be picking a fight with Selena Gomez and calling David Guetta "gross" to having her debut album command the top spot on Billboard's Hot 100 for a sixth week. Pure Heroine stay in the Top 10 of Billboard's 200 chart for five weeks while also topping Miley Cyrus in September on iTunes' singles chart. Last night, the 17-year old appeared on The Late Show with David Letterman and performed "Team" and earlier this week, it was announced that Lorde will perform at KROQ's Almost Acoustic Christmas at Los Angeles' Shrine Auditorium on December 8th. On top of all that, she was recently named one of Time Magazine's Most Influential Teenagers in the world. Anything else? Well, next week you when Hunger Games: Catching Fire hits theaters, you can catch her cover of Tears for Fears' "Everbody Wants to Rule the World" on the soundtrack - a fitting cover since Lorde is practically ruling the world since her release of her new album.